The HowToChinatown.NYC web project is kicking off again for 2019! We need your help to tell stories about Chinatown's small businesses. Come to our workshop this Sunday— food will be provided. We'll (re)introduce the project and demo the platform. Volunteers who have stories in progress: we'll help you finish! Location: The Florentine School, 219 Park Row. Please RSVP here. HowToChinatown.NYC's goal is to build an online platform to support Chinatown by working with local businesses to build an web presence, while providing an alternative to sites like Google and Yelp. The beautiful stories of Chinatown you help to create will be hosted on HowToChinatown.NYC website, which will feature a map-based narrative about Chinatown. As a volunteer contributor, you will be trained on how to use our platform. You will build relationships with local businesses and help them build an online presence. Volunteers with Cantonese or Mandarin language skills are especially needed. Hello! This is a reminder that the Lantern Viewing Party has been rescheduled for Thursday, Feb 21st from 6-8pm @ 5 Essex Street. We’re rescheduling this outdoor event due the cold weather. Thursday will anticipate warmer temperatures, which should improve the experience for both our volunteers and visitors. We hope we did not cause any inconvenience, and look forward to seeing you on Thursday! Due to the cold outdoor weather on Tuesday, February 19th, we are moving the date of the lantern viewing party to Thursday, February 21st. We apologize for any inconvenience and hope to see you join us on Thursday! Thanks to DLJ for sponsoring the art! The lantern art installation draws its inspiration from an object appropriate for the Year of the Boar: a piggy bank. Instead of directly referencing the image of a piggy bank, the circular lantern art piece with a square collection box at the center focuses on its symbolic meanings and reflects the idea of completion and reunion. (圓滿、團圓) . It also refers to an ancient Chinese coin. Totality is an extended public project from Lulu’s ongoing work series, Look into the Mirror. The front surface of the lantern is mirrored. Yet, under different lighting conditions, one can see what is inside the lantern, or see one’s own reflection juxtaposed with what is inside. Scattered inside the circular lantern are numerous red envelopes, some with handwritten notes on them. These red envelopes are from Lulu’s parents and other family members, given to her throughout the past twenty years. Each envelope represents a special occasion in her life: birthdays; entering high school; college; and celebration of the Lunar New Year. In a way, this lantern is Lulu herself. What's inside is personal. It is covered, but is always there. It reveals itself when the light is right. LuLu Meng is a New York-based artist born in Taipei, Taiwan. Her multidisciplinary practice, including installation, sculpture, photography, drawing and video, explores the difference and similarity among cultures and people. Celebrate the new year with our neighbor, Museum at Eldridge Street. In the sanctuary of this historic synagogue there will be warmth, tea, and friendly T!C artists and volunteers to create Lunar New Year decorations with you. We’ll have some calligraphy demonstration & instruction, along with stencils to help participants young and hold create a red square door decoration and lanterns. 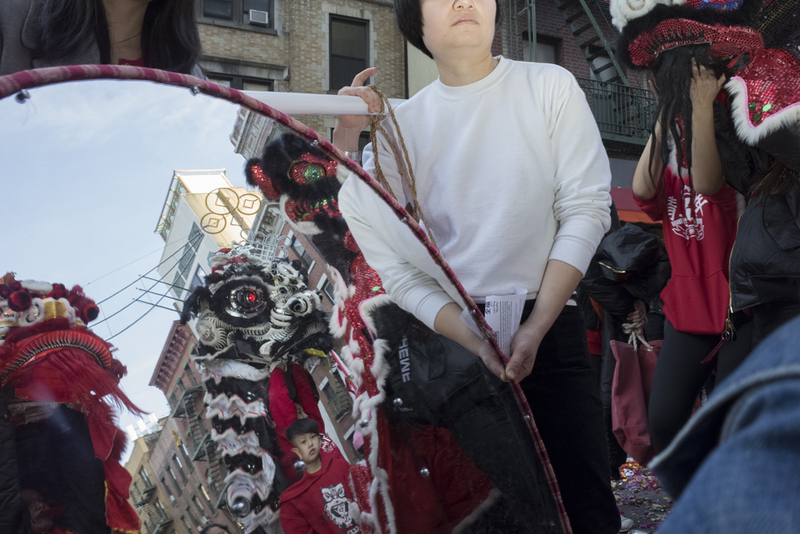 The Chinatown New Years parade passes right by the museum (12 Eldridge Street) so stop in for a chance for free admission to explore this beautiful space and to make new friends with the T!C and Eldridge St crew! This free event is supported in part by Fay & Tung Associates, LLC and DLJ Real Estate Capital Partners. [Feb 5] Look out for LuLu Meng's lantern installation among the lion dances, confetti, and all the hot & noisy celebrations of New Years day. The T!C team will carry the art piece up and down Mott St, before it's installation at the bamboo garden at 5 Essex St. We'll be starting from the south end of Mott St approximately at 12pm, 1pm, 2pm and 3pm. The lantern art installation draws its inspiration from an object appropriate for the Year of the Boar, a piggy bank. 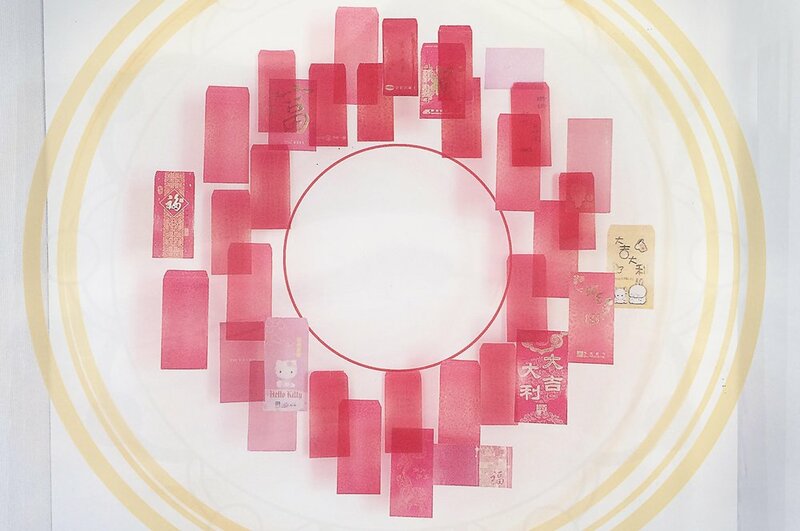 Instead of directly referencing the image of a piggy bank, the circular lantern art piece focuses on its symbolic meanings and reflects the idea of complete and reunion. (圓滿、團圓) . Thank you to DLJ for sponsoring the artwork. Chinatown Arts Week 2018 Video! Thanks for joining Think!Chinatown for our first Chinatown Arts Week. We had so much fun learning about Chinatown culture together. For those who were not able to make it, or for those who want to relive it, here is an amazing video filmed and edited by Eric Jenkins-Sahlin with footage from Charlotte Li & Birdie Park. 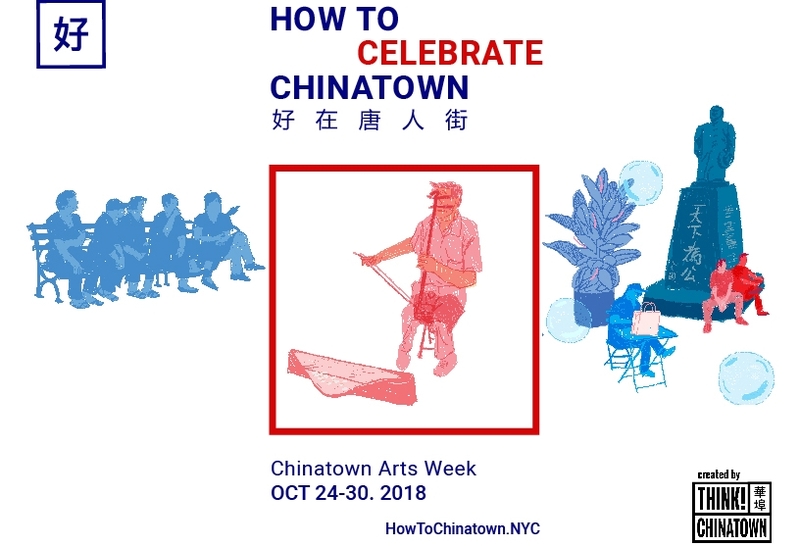 Celebrate the first Chinatown Arts Week with musical performances by Mencius Music Society, projections from Asian American art archives, tastings from Ming River Baijiu, Chinatown eats, and drinks with new and old friends. Come by at 5:30pm to hear Think!Chinatown and partners present their new map-based platform, HowToChinatown.NYC. We hope that Chinatown organizations will find this platform as a useful tool to cross promote, find synergies, and work together to strengthen the neighborhood. Thank you to our hosts, DLJ for supporting this event. Sit down for a few rounds of tea with Mr.Chen. Learn about his wide collection of tea, specializing in leaves from Fujian. If you ask, he’ll share pictures of where the tea comes from and how the tea is produced. $10 a sitting (20-30 mins, and please tip if you stay if you linger). Seating is limited, so circle back around if he’s full up. Practice Tai Chi and make new friends with an amazing view of the Manhattan Bridge. Shifu Sherry will take us through empty hand formations. Wear loose clothing and comfortable shoes. Suggested donation: $5-$20 cash for instruction. Sherry Zhang Xiao Qin is a faculty member at the Pacific College of Oriental Medicine, teaching tai chi and qi gong. A native of Hubei China, she holds a bachelor’s degree in physical education from Chengdu Physical Education Institute in Sichuan and was an associate researcher at the Chinese Wushu Research Institute in Beijing. Zhang also worked for the China Wushu Association for 15 years and was certified by the Association to teach tai chi and qi gong. 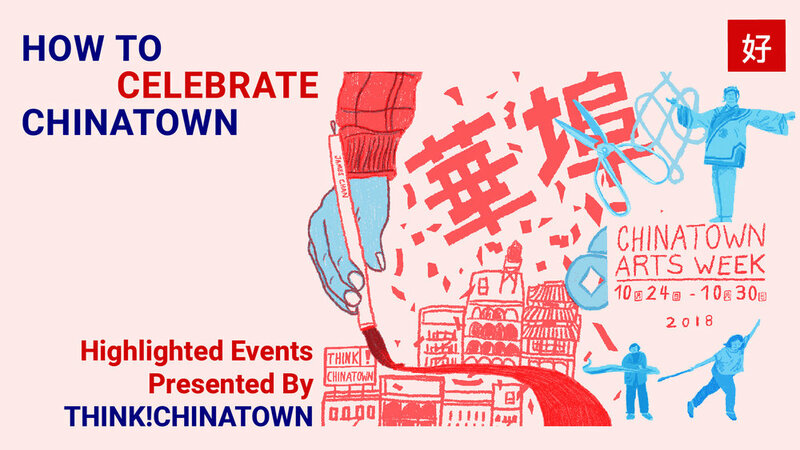 Urban Archive is organizing a digital scavenger hunt for Chinatown Arts Week! The Hunt will be all across Chinatown, but we’ll meet up first at 5 Essex for hot cocoa and instructions. Enter in teams, or pick up a team with new friends! 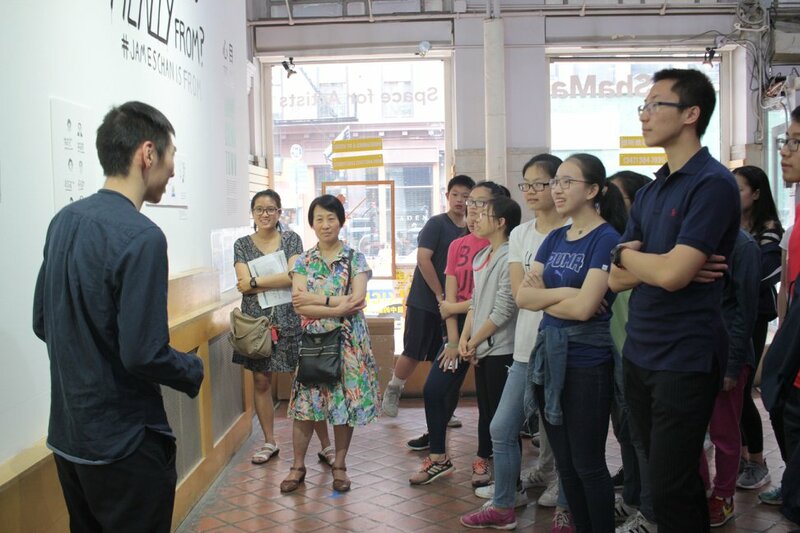 Explore Chinatown’s architectural history… maybe visit a local museum, and perhaps you’ll win some prizes from sponsors Pearl River Mart and the Chinatown Ice Cream Factory. Prominent Chinatown photographer, Corky Lee, will share stories from his series, “Bygone Chinatown” which is mapped on our HowToChinatown.NYC platform. Thank you for DLJ for hosting the event. What are hands made for? Are they for scratching, rubbing, or counting beats? In this work a mother holds her daughter’s hand, which conveys how the previous generation took care of the next generation. It also tells how a self-taught artist, Lisa Shia, used her paintings to document her life stories growing up in Meng Xia through a scroll that she painted. The show’s elements include shadow and light, object manipulation, Kamishibai style storytelling, and music. The show is 20 minutes and will be performed twice: 5pm in English (英语) 6pm in Mandarin (普通话) Doors Open at 4:30pm. There will be a post performance Q&A with the artist. VOTESart COMMUNITY CONCERT W/ E. FUZHOU OPERA ASSOC. VOTESart is non-partisan organization that works with musicians to engage their local communities through pop-up concerts in community spaces. The program will include a special selection of classical music for a Chinatown audience and feature excerpts of Chinese Opera performed Eastern Fuzhou Opera Association. Audience members will be engaged in bi-lingual get out the vote activities interspersed through the performance. Chinatown Arts Week will close with a night of readings by Asian American writers curated by Julie Chen. Stay tuned for more info. 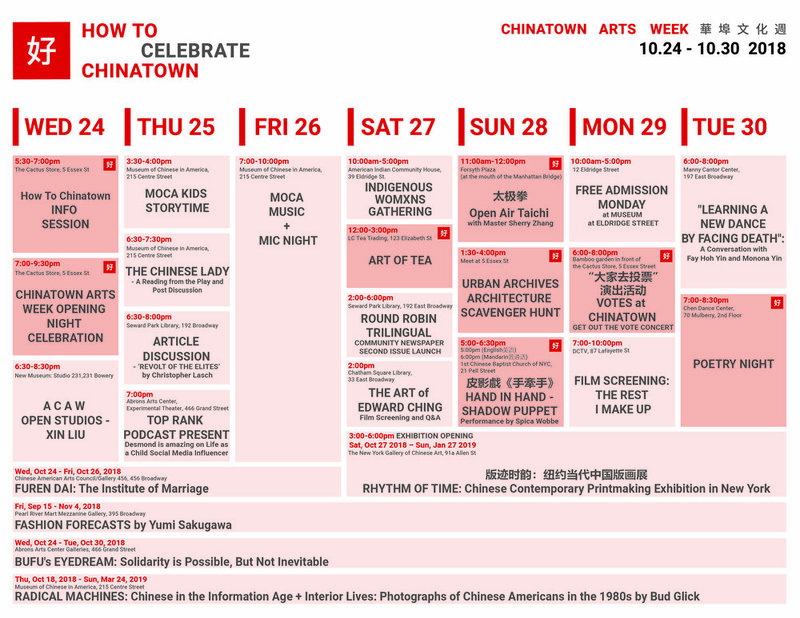 Celebrate the launch of HowToChinatown.NYC and our first Chinatown Arts Week. October 24th, 5;30-9pm. More info coming soon! Cooking With Granny comes to Chinatown! Just as you start feeling the sniffles from seasonal changes, have a taste of Grandma Mamie Chinese Medicinal Chicken Soup, a recipe that has been in her family for generations. Grandma Mamie will talk about 补品 (traditional Chinese herbs) used in soups along with the cultural stories that bring this dish to life and puts the immigrant grandmother in her much-deserved spotlight. Grandma Mamie will show a few other herbal remedies relevant to the change in weather in autumn. Learn about Chinese concepts of food as medicine and connecting to our natural environment. Cooking with Granny is a video and event series where diverse immigrant grandmothers cook and tell stories. Events include their signature Cooking & Storytelling Sessions and Grandma Dinner Parties. They have been featured on the New York Times, NBC, and Food and Wine, among others. Italian Grandma Gerarda is taking the stage with an interactive gnocchi session in October! Follow Cooking with Granny on Twitter and Instagram @cookingwgranny. Thank you for joining us! Thank you for supporting us! Here is a video recap of that wonderful evening spent together in June this year! For a night celebrating culture and community, we gathered artists and friends to enjoy music, drinks and delicious Chinatown eats. Chinese dancer Ling Tang graced us with her beautiful dance performance, accompanied with music by the talented Zhou Yi and Yimin Miao from the musical group Ba Ban. We were also enchanted by the award-winning vocalist Vivi Hu as well as by Chien Chien Lu and Santiago Sebastian Chiriboga from the band little BUH. Thank you to Sheng Lin for creating this video, and a big thanks (and music credits) to Little BUH for the amazing performance. Much love to the other performers of the night: ViVi, Meemee Chin, Ling Tang & the Ba Ban Music Society. It couldn't have been done without the generosity of all our sponsors: Ming River Baijiu, Tsingtao Brewery, Hiro Sake, Alimama, Oriental Garden & Luv Tea. To the Think!Chinatown team of volunteers & supporters...love love love! Do you want to support small businesses in Chinatown? Join us this Sunday at 1pm for a training workshop about how to work with local businesses to establish an online presence for their products and services! Bilingual volunteers are especially needed. Join us next Wednesday night for a very special poetry reading, hosted by our very own Julie Chen! Readers will include Cindy Tran, Sarah Wang, and Kiran Bath. Cindy Tran is a 2018 Poets House Emerging Poets Fellow. A recipient of fellowships from The Loft Literary Center and Brooklyn Poets, her work appears in AAWW's The Margins, Nice Cage Magazine, and Copper Nickel, which gave her an Editors' Prize. In her free time, Cindy writes Yelp reviews, hoping that someone will search for a pork sandwich and find a poem about sandwiches and racism. Visit her at www.cindymtran.com. Sarah Wang has written for n+1, The Los Angeles Review of Books, Conjunctions, Stonecutter Journal, Joyland, 6x6, the Asian American Writer’s Workshop, Story Magazine, The Third Rail, and The Last Newspaper at the New Museum of Contemporary Art, among other publications. She is the coeditor of semiotext(e)’s Animal Shelter. See more of her work at wangsarah.com. Kiran Bath is a multi disciplinary artist from Brooklyn by way of Sydney. Her poems have been published in Tidal, Antiserious, Typishly and other journals. Kiran stays true to her Gemini ascendant and moves between dreaming up poetry to writing critical essays, to storytelling via photography to human rights activism via her attorney hat. Kiran is obsessed with the art of storytelling and is still trying to get over how bad coffee is in America. Wine reception starts at 6:30pm and readings begin at 7pm. Come join us for an activity-packed Sunday, starting with an hour of Taichi from 12-1PM, followed by tours of his exhibit by James Chan himself in English and Chinese from 3-5PM. Amy Chin will be leading a Chinese-American geneology workshop at 5:00PM. Bring your friends and family! "Where Are You Really From?" 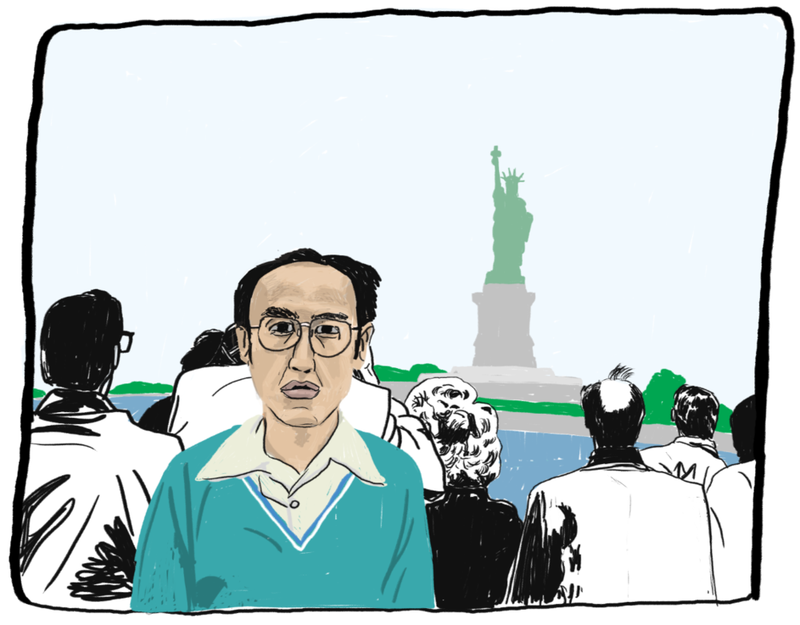 follows artist James Chan’s journey through his own genealogy research, as he learns more about his paternal family history. Beyond his grandparents, Chan never knew how he was related to family members he had met throughout his life. Family reunions were a foreign concept to him and the nearest relatives were thousands of miles way. Using secondhand accounts, historical research, photos and unreliable personal memories, Chan takes the winding path to document his family’s history before it is lost forever. Along the way, he confronts key moments of reflection on personal identity and relationships. The discoveries, family stories, musings, and challenges encountered during the project are presented in a series of illustrations and paintings. Where Are You Really From? follows artist James Chan’s journey through his own geneology research, as he learns more about his paternal family history. Beyond his grandparents, Chan never knew how he was related to family members he had met throughout his life. Family reunions were a foreign concept to him and the nearest relatives were thousands of miles way. Come You Back to Maynila Bay is a community engagement printmaking project by Karl Orozco that uses hand-carved mahjong tiles to retell family narratives of his lola’s1 underground gambling den in the Philippines. 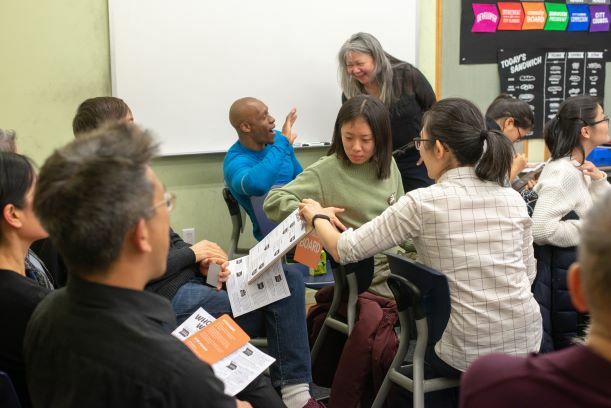 In partnership with Think!Chinatown and ChaShaMa, Orozco will activate the space at 384 Broadway to create a public game hall and lead intergenerational printmaking workshops with Chinatown's youth and elders. As a Filipino-American artist and educator, Karl Orozco’s work grapples with the legacy of colonialism and seeks to challenge assumed notions of family, migration and power. Influenced by Tagalog creation myths, sociolinguistic research, and historical accounts of colonial resistance, Orozco has deconstructed meaning throughout the traditional Chinese mahjong tile set and reinterpreted them for a Philippine worldview. Orozco wrestles with the cultural dominance of the Philippines and seeks to reclaim a visual heritage lost through centuries of inter-Pacific trade, Spanish colonization and U.S. imperialism. Orozco will run printmaking workshops throughout Sundays in May where he will invite audience members to play games of mahjong and create printed “bills” recording their winning hands. Inspired by his lola’s Manila gambling den - conceived to keep her absent husband homebound - and by his own childhood experiences being told that mahjong was “a game for adults”, Orozco hopes to create an inclusive gaming space where participants of all ages feel engaged and leave lucky. THINK!CHINATOWN is a collective of neighbors and advocates working to keep Chinatown a vibrant place of inter-generational learning, cultural production & civic engagement. We are here to listen, to respond, and to build Chinatown's capacities as a strong immigrant neighborhood of NYC. 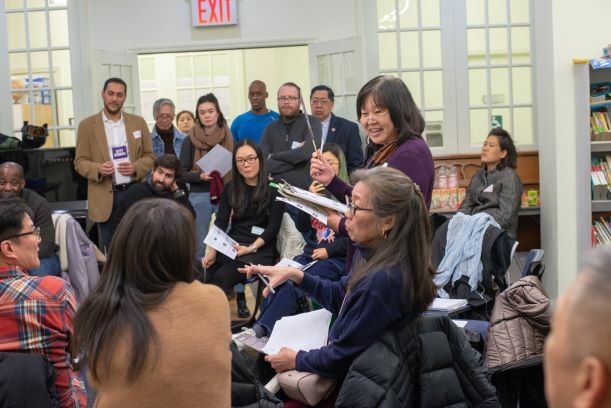 Our mission is to attract & connect resources for Chinatown organizations & businesses using the tools of design & community engagement. Join us in connecting past, present & future to ensure a resilient Chinatown. Thank you to Tsingtao Beer for sponsoring the reception. T!C's Everyday Chinatown Project got a little love from Sinovision last week. Check out this great video by Jane Shi and Gabriel Garcia Rosa. Visit these locations to see and hear this community project. T!C's residence @ 384 Broadway has been extended! We are happy to announce that T!C will continue to bring you programming for a couple more months in our pop-up space in partnership with Chashama. Enjoy an extra few weeks to visit this amazing exhibit curated by Stephanie Tung. Come explore exhibited archives of contemporary Asian American Art. Wanna learn more? Check out this video made by T!C member, Hai-Li Kong, about the Epoxy Art Group in interview with featured artist, Ming Fay.